The media can be a cynical bunch when it comes to movies. But journalists wept at a private screening Monday afternoon in Columbus, Ohio for the controversial 9/11 film United 93. Director Paul Greengrass (Bloody Sunday, The Bourne Supremacy) recreates the events on the doomed Sept. 11, 2001 airliner, a counterattack by the passengers against the terrorist hijackers, with real-time precision and gripping drama. Greengrass has made a matter-of-fact suspense movie stripped of sentimentality but its cinematic qualities may suffer in the wake of public sentiment. The time may not be right for any 9/11 movie no matter how good it might be. United 93 begins with prayers. The young terrorists kneel and pray in a non-descript budget hotel. Their faith is undeniable, although misdirected at terror. One young man shaves his belly in preparation for strapping on a bomb. “It’s time,” his comrade-in-terror announces. No other words in the entire movie carry such a solemn weight. Greengrass uses traditional cinematic elements to build tension throughout United 93. Thumping music by composer John Powell emphasizes the suspense. Ariel footage of Times Square unfolds with a slow and steady hand. The impact is eerie, a view of Midtown Manhattan before the horror struck. 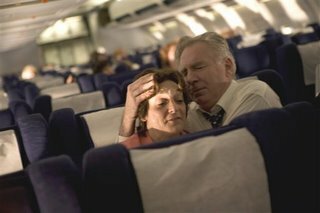 Greengrass, a veteran documentary filmmaker, boosts United 93 with “you are there” moments. Everyday people are at work at Newark’s Airport: fueling the planes; preparing the cabin, checking in passengers. The jet crew arrives at the terminal. The air traffic controllers arrive in the dark control rooms. One passenger barely boards the plane in time – a tragic twist of fate – and the thump of the cabin door is ominous. United 93 is ready for take off and there’s no reason to expect anything out of the ordinary. Handheld camerawork (courtesy of cameraman Barry Akroyd) puts you in the plane. The camera glides above the cabin seats and up close to the thirty-odd passengers. Granted, United 93 is a polished, Hollywood movie but it’s also grounded, and naturalistic in the best sense of the phrase. United 93 is as honest as any Hollywood can be – even more so than recent true-life dramas like Traffic and Syriana. Greengrass, who also wrote the script, never shows the overseas plotting responsible for the terrorist attacks. He has not interest in fleshing out the story. United 93 is about the core action, what’s happening on the plane and that’s more than enough to take one’s breath away. Things begin to go wrong when Boston air traffic controllers lose contact with American Airlines 11. They monitor the computer screens in search of answers they cannot fathom; staring at blips on a monitor, green glowing lights like fireflies. It’s everyday business back at Newark’s airport as United 93 finally takes off. In the distance stand the twin towers of the World Trade Center, symbols of all that went wrong that day. The story flits from the traffic controllers struggling to comprehend what’s transpiring to the chaos aboard United 93. A knife to a passenger’s throat leads to screams, bloodletting and the breach of the cockpit. Two terrorists defend the cockpit with knives. The key questions: is the bomb strapped to the one man’s chest real? Back on-ground, military leaders debate the rules of engagement – should they shoot down the planes once they get close to Washington DC and air traffic controllers decide to shut down the air space. But it’s too late to change what’s happening on United 93. For a film comprised of mighty ifs — it’s hard to know what really happened onboard — Greengrass makes everything believable. It’s these final scenes of hand-to-hand conflict that shine brightest thanks to Greengrass’ style of up-close filmmaking. There are different levels of bravery among the passengers as well as acts of cowardice. One question unites the passengers determined to fight back: who is going to fly the plane? Everyone does the same thing when their life is in jeopardy: they reach out to their loved ones to tell them they love them. The lead terrorist makes a good-bye call. So do many of the passengers in the cabin. As the Western Pennsylvania countryside comes rushing towards the cockpit window, one wonders if there are any true villains on board. Perhaps, United 93 is a flight of victims, young terrorists twisted by their faith, and the innocents killed by their misguided actions. The evil lurks in faraway shadows, far removed from the horror. Greengrass’ movie is just one piece of the healing process. Ninety relatives of the victims of the flight watched United 93 at the Tuesday launch of the Tribeca Film Festival in Manhattan. The audience wore pins commemorating the passengers. There is a planned monument in Shanksville, Pa., the site of the United 93 crash. But a movie, especially one as powerful as United 93, is the best memorial of the heroism that occurred that day. Movies are best at bringing out emotions and in this case, tears mean more than any thumbs up. Universal Pictures releases United 93 in theaters nationwide April 28.